How do you want your audience to view your business? Marketers spend lots of time constructing marketing personas to model their content’s target audience yet don’t consider how they’re viewed by others based on the content they create, distribute and share. They forget: You don’t get a second chance to make a great first impression. You can’t be all things to all people or you end up having nothing to distinguish you from everyone else. When I worked at Bertelsmann, the mass audience book clubs built sales by creating small niches in the midst of their broader brand. 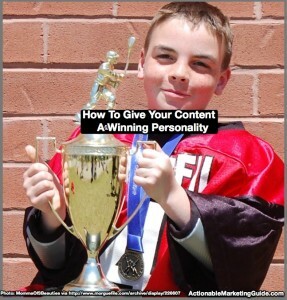 You have to create a winning content personality for your business that lures prospects into your information and converts them into customers for life. If you don’t take the time to define your business and how you want the world to view you, they’ll do it for you. James Chartrand is one of the best examples of how a distinct content personality attracts an audience. After discovering clients preferred dealing with a man and paid more if they did, she (yes you read that correctly) adopted a male pen name and business brand. She built her blog and business, Men With Pens, by delivering no nonsense writing advice and related copywriting and website services that her readers believed came from a man. Until coming out so to speak in a Copyblogger article entitled, Why James Chartrand Wears Women’s Underpants, Chartrand kept her feminine side quiet. To this day, while she’s added her image to her website, she’s kept her personal life private. Before you question her transparency, Chartrand delivered the same quality information that she had before calling herself James and since announcing that she was really a woman. She needed the business persona to break through, establish herself and build a loyal readership of 40,000+. The bottom line: Your content needs a winning personality to stand out. Your target audience is suffering from an inability to focus on the information they choose to consume. Given the never-ending onslaught of content which they’re forced to contend with on a regular basis, they don’t need a doctor to tell them that they suffer from attention deficit. As recent data reveals the average American consumes content for over 11 hours a day. This translates to multi-channel consumption, snacking and skimming. Therefore your content must work extra hard to make any impression before your potential reader moves on. Here’s a 10 point content personality checklist to help you make the right impression. To help you develop your content personality, these points are posed as questions so you only have to answer them. 1. What’s your business’s attitude towards its community and the world around it? What are your business’s values and beliefs? What does your business stand for? As millennials become the dominant buying force, this is more important. Research shows that millennials support businesses that are aligned with their views. At a minimum, determine the 3 adjectives you’d use to describe your business. 2. Who are you creating your content for? Who is your target audience? At a minimum, you need to develop a marketing persona. Focus on building a long-term relationship with your readers, not just making a one-time sale. Your content is the basis for that relationship over time. What emotions do you want your content to elicit? Does this come through so that your content stands out from the sea of other information? 3. What do you want to communicate? Who influences your business’s thinking? Does it come from the top down or is there a flow of ideas through your business? What topics do you want your business to be known for? This is a key point that’s often undervalued. 4. What’s your business name and related social media handles? Do strangers understand what you stand for? If you’re not sure, ask them what they think? Your guess may be totally wrong. What is the type of image do you want your business to create? Bear in mind that this must be aligned with the type of business you have. No one wants to use a bank that is warm and fuzzy. They’ll think that you’ll lose their money. Take time to consider alternative names and handles. What seems great in a brainstorming meeting may not resonate with your audience. Pam Moore has done an amazing job making her agency work with the name MarketingNutz. 5. How do you present your brand? People are visual beings. Looks count and influence first impressions. For content marketing, this means images, photographs, and videos as well as text. If your content was a person, how would she dress? Casual, business suit or black leather jacket (my personal favorite!) Take a page from Joe Pulizzi’s playbook. He’s Mr. Content and is distinguished by his orange clothes. Be consistent. Once you start with a color palette and typeface, keep using it. This is one way that small businesses can stretch their budget!!! 6. What kind of language does your business use? Is it polite and formal or filled with slang and foul language? Erika Napoletano stands out because her language isn’t always fit for your grandmother. That works for her brand and her content. You have to determine what works for your business and you audience. 7. Who is the company your business keeps? What do your employees, customers, peers and influencers think of your business? I’ve worked with many businesses where what the executives thought was very different from their employees and customers. If you’re afraid of asking this question, you’ve got a problem. Don’t just focus on the views of your internal audience and customers. Find out how influencers perceive your business. Often, this can be difficult to ascertain directly. 8. How does your business stand out from your peers and competitors? Take the time to do a competitive assessment. Again, ask your customers what alternatives they’re considering. In my experience, most businesses take a very myopic view of their competitive set relative to their customers. 9. Where does your business show up, online and offline? Do you have an up-to-date online presence that’s mobile-friendly? If you’re not mobile first, you’re invisible to many prospects. Without this, your content doesn’t have a fighting chance. Which social media platforms does your business engage on? How does this relate to your audience’s expectations? Social media matters as a means of content distribution. What type of interactions do you have? Do you just expect people to share your content or are you truly interested in what they have to say? If you have a physical presence or retail establishment, what’s it like? Does it extend your content personality? 10. What’s the context of your information? Given the different variables that influence how, when, and where your audience consumes your content, how can you target it to make it more relevant? This means that you have to add devices into your mix. (BTW, here’s how to create a blog personality). Your content personality is key to attracting and keeping your audience’s attention. Take the time to ensure that it’s aligned with your business. Once you’ve completed the content personality checklist for your business, use it to keep all of your content consistent to maximize its power to build customer relationships and sales. What else would you add to this content personality checklist and why? Tags Darren Rowse, erika napoletano, James Chartrand, Joe Pulizzi, Pam Moore. Bookmark the permalink. Great Article. We’re dedicating time in our site to have a blog. By taking this advices into serious consideration will help as achieve even better results. We do have original content, but after reading this I can clearly see that we have to keep work in forking it’s personality. Thanks!